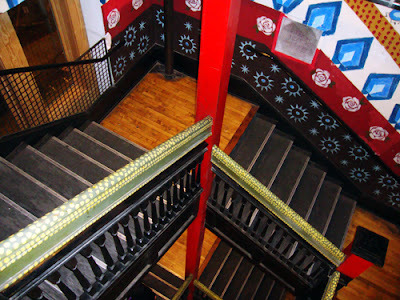 The Tabernacle is one of the coolest, and most colorful, music venues in all of Atlanta...even the stairwells are painted so funky (photo), you don't know if you're in a music hall or an art gallery. Once a church, now a concert venue, The Tabernacle also features a chandelier that once hung in the Lowes Grand Theater where Gone With the Wind premiered in 1939! How cool is that? And that's a little known fact, so tell all your friends. The last time I was at The Tabernacle, when I snapped this photo (actually my first time there), was to see Margaret Cho...what a fun concert! Never been, more pictures please! Still, it's hard to top a giant truck. You're right, Terry...the giant "Tonka" truck was really exciting to see. I'd go back to Tellus Science Museum just to that single display! The Tabernacle is a really cool music venue. Keep an eye on their website for a performer that interests you and get tickets. That's the best way to experience it, I think.